Whoop whoop, it’s Stampin’ Creative Blog Hop time again, and this time it’s a Trick or Treat theme!! Now we don’t normally do Halloween a lot round my way, I had a couple of parties as a child, and then that was pretty much it. As we don’t have our own kids we have never got into the swing of things, but I have to say I do love all the ghoulies and ghosties and wee wicked beasties that I see all over the place. They are kinda cute! If you’ve hopped over today from Caro welcome, just click the Next image at the bottom of this post to hop around. I’m sure you’ve been inspired already, and there’s more to come! We have a GUEST stamper with us today too, Danielle from the Netherlands – we’re going International!! I love the fact there are so many coordinating products in the Autumn / Winter catalogue. One of the best bundles is Cookie Cutter Christmas & Builder Punch – but there’s more. Did you spot the Cookie Cutter Halloween stamps too? They match the punch as well! Double trouble for your bubble! (sorry got a little carried away there!) 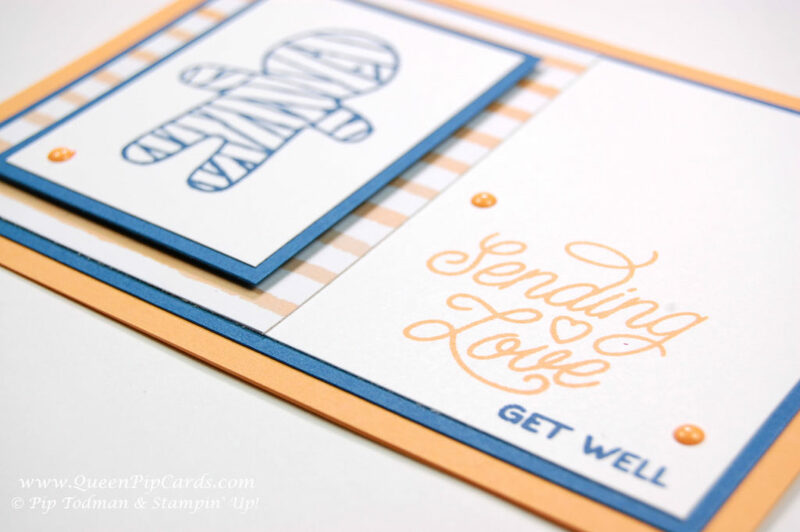 You can stamp and punch out to your hearts content, but sometimes you don’t need to punch – stamping is cool on its own. 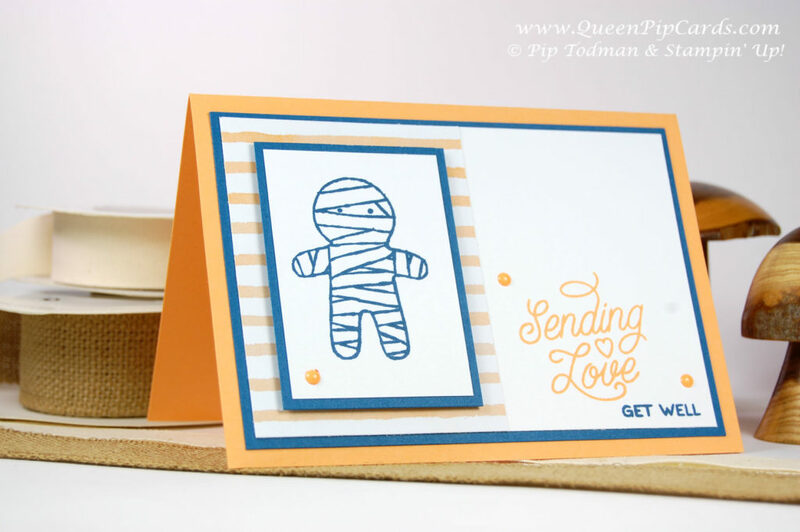 For this card, I took the Mummy image, and turned it into a bandaged up person, so it looks like it’s someone who’s poorly. So my trick is that it’s not a mummy it’s someone who needs some Love and Get Well wishes! Cute isn’t he? The colours work really well together don’t you think? Dapper Denim and Peekaboo Peach with a bit of the Fruit Stand Designer Series Paper under the topper. The wording is from my go to set Designer Tin of Cards! 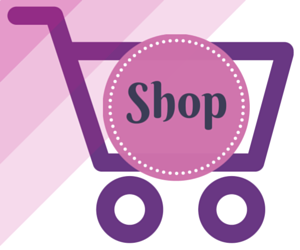 If you’d like to add these to your shopping basket, then click the links below or go to My Shop. 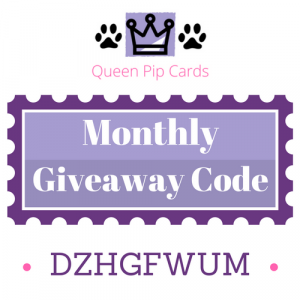 Before you go shopping though, hop on over to Sarah (click here or the image) and see what she has in store for us in her Trick or Treat cupboard!